Author name: Anton Raphael Mengs. (1728, Aussig, Bohemia – 1779, Roma, Italy). He was taken to Rome to study with Marco Benefial and Sebastiano Conca from 1741 to 1744. In 1744, living in Dresden. Mengs soon returned to Rome to continue his studies of ancient and Renaissance art in 1746. His study of ancient sculpture and of the masters of the High Renaissance, Michelangelo, Raphael, and Correggio, became the basis for his personal style. 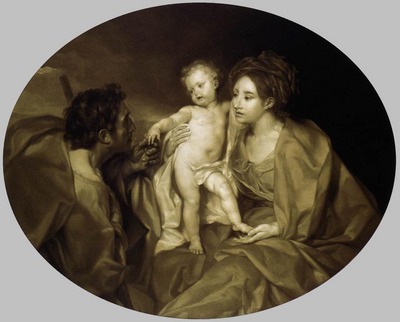 In 1761 Mengs was called to Madrid, where he was appointed court painter. He painted religious paintings, allegorical works, and portraits. Returned to Roma in 1768.